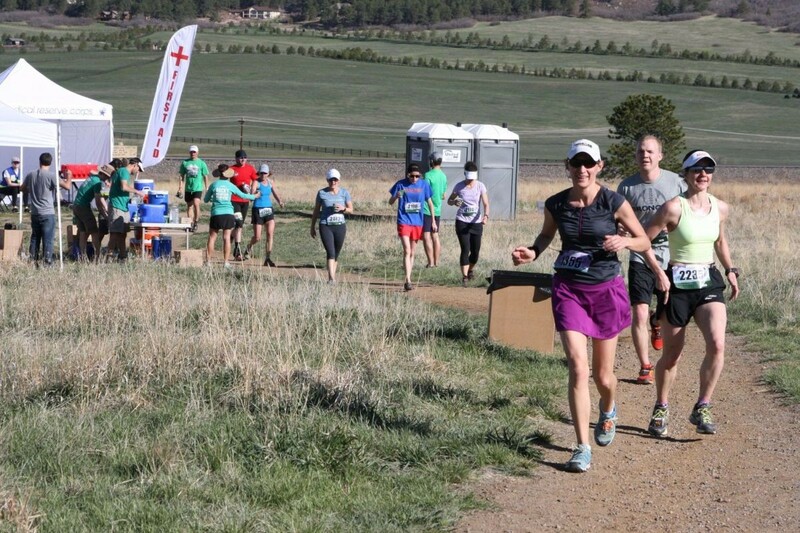 The Greenland Trail Race offers four outstanding distances in southern Douglas County. Run the 4 Miler, the 8 Miler, the 25K, or tackle the 50K ultramarathon, Colorado?s fastest 50K! With Pikes Peak as your backdrop, you'll cruise over a soft dirt trail on your way to a new personal best. With chip timing, an innovative technical running shirt in men?s and women?s sizing, food and beer at the finish, this race will make you want to come back for more! The Greenland Trail Race course is located within over 3,000 acres of the Greenland Open Space. Part of the Colorado Front Range Trail, the Greenland Trail joins into the Old Territorial Road, connecting the old Greenland Town site to Palmer Lake. The course passes through native grasslands, by ponds, through rolling Gamble oak hills and skirts ponderosa pine forests allowing for outstanding views of Pikes Peak and the surrounding buttes. Starting from the northern trailhead, the course travels south on the Old Territorial Road. At the first intersection, runners will continue to head south (straight) towards Palmer Lake. After 1.3 milers, runners in the four mile will turn up and onto the Luge Trail and connect with the Kipps Loop Trail to the finish. The four mile race course is approximately 4.25 miles. After 3.5 miles, eight milers, 25K runners and 50K runners will turn left onto the Kipps loop and run up and over the saddle, which is the high point of the course at 7,400 feet, at five miles. The next three miles are all downhill to the eight mile finish. Runners will make a right on the Greenland Trail at seven miles. 50K and 25K runners will run to their respective turn-around points and then follow the Greenland Trail back to the Old Territorial Road where they will veer left and follow the above route again. Eight mile and four mile runners will run straight to the finish line at the shelter area. 50K runners will compete the loop four times before heading to the finish, while 25K runners will run the loop twice before going to the finish. The entire course is run on dirt trails. With wide, smooth double track trails, the Greenland Trail 50K is a very fast course and also very beginner friendly. There will be an aid station at mile 3.5 and 7.5 of each loop. There will be no aid stations in the four mile race. Each aid station will provide Gatorade drink and water. There will be gels at each station for the 50K and 25K runners, starting on the second lap. There will also be a variety of salty food items. We encourage runners in the 25k and 50K to carry their own refillable bottles. This will help us to decrease the amount of paper waste we produce at our aid stations. There will be a portable restroom placed at the southern edge of the course, at the 3.5 mile aid station.